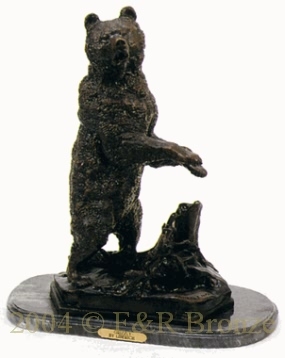 This bronze statue by Liberich is handmade and cast in the traditional Lost Wax Casting Process. This insures a quality bronze sculpture that may be passed down from generation to generation. Grizzly Bears are known for their size and strength. The Grizzly Bear is probably one of the most popular bear breeds known. Mounting brackets can be welded on the larger pieces for an additional $49.95. To view the monumental size of this bronze click here.